Nicholas Braime joined 4B in 1972 after graduating from Oxford with an MA in Modern History. Initially Nicholas trained in the drawing office and production departments, while doing day release engineering courses at Kitson college before continuing his formal studies, with a diploma in management studies at Leeds Metropolitan University. In 1976, Nicholas took on the responsibility for developing the sales of components used in the bulk material handling industry. In 1984 he moved to the USA to set up a branch office of the new subsidiary 4B Elevator Components Ltd, before returning to the UK in 1987 to take responsibility as Sales Director for Braime Pressings Ltd. Nicholas was elected Chairman in 1987. He is responsible for the operational management of the company and for developing group strategy. 4B Braime is located in Leeds, England and is the original and UK based subsidiary, and also the HQ, of the ‘4B Group’; consisting of seven subsidiaries located worldwide and developing and selling products into the global material handling industry in more than 50 countries. 4B Braime was founded 128 years ago by your grandfather and his brother. Would you say that a family ethos extends throughout the business today? The business is a publicly owned company on the Stock market, managed formally according to the regulations of that Market and the Board of Directors have responsibilities to its shareholders and employees. However, control of the company is still in the hands of my immediate family and myself and the business still has the ethos of a family business. Engineers dominate the company and are encouraged to define their own role, to take the lead in setting their targets and to pursue their own ideas, providing they fall within the overall strategy and plan. This system revolutionised grain handling in Europe, achieving much larger throughputs in smaller machines and led to a significant increase in efficiency. Over time this system has largely been adopted globally, where it is now commonly called ‘a low profile’ bucket system. The founders of the business were two young engineers, who started with nothing except drive and the skills they had been taught as Engineering Apprentices; yet within a generation, the company employed over a 1,000 people. The brothers were entrepreneurs and their success was rooted absolutely in their ability to constantly innovate by taking commonly used products and making them “better by design”. This was achieved by adding practical features, often patented, and by improving the product quality by using an entirely different method of manufacture. They always focused on design which gave tangible benefits to the engineer using the product. As the sheer volumes of cereals being stored and processed increased, dust explosions in grain & feed facility’s became more frequent and a significant number of such accidents started in a bucket elevator or conveyor, where the grain dust was ignited by an overheated Bearing or by the frictional heat generated by a slipping or misaligning belt or blockage. In the 1980s, 4B Braime developed the Watchdog, a ‘4 in 1’ Monitor which would give an early warning of the increased risk, sound an alarm, and shut down the machinery if the risk continued. The Watchdog became the ‘market leader’ in North America and the signature product of 4B. This is the real ethos which continues to run through the business today. 4B is not a simply a sales or distribution company but is first and foremost an engineering company focused on practical innovation by engineers for engineers. The Patented “Hazardmon” System, which won a GRAPPAS award for innovation at Victam, is the latest major development at 4B. Hazardmon is an independent cloud based system collecting Realtime information enabling management, locally or remotely, to monitor machinery throughout each Facility and also predict the need for preventative maintenance. How do you inspire and motivate your team to consistently deliver world-class products and service? Fundamentally, you have to take a lot of care in the first place to recruit staff who you think have the potential to flourish in the culture above. If you choose the right people and give them freedom and encouragement, this opportunity is itself inspiring. With subsidiaries worldwide, where do you see the future for 4B Braime? It is not fashionable to join a company for life and we do not look it at that way. 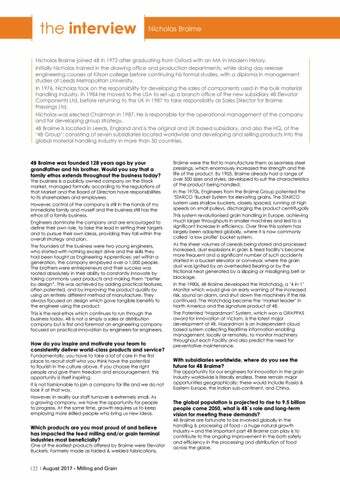 The opportunity for our engineers for innovation in the grain industry worldwide is literally endless. There remain major opportunities geographically; these would include Russia & Eastern Europe, the Indian sub-continent, and China. However, in reality our staff turnover is extremely small. As a growing company, we have the opportunity for people to progress. At the same time, growth requires us to keep employing more skilled people who bring us new ideas. The global population is projected to rise to 9.5 billion people come 2050, what is 4B`s role and long-term vision for meeting these demands? 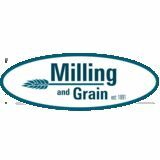 Which products are you most proud of and believe has impacted the feed milling and/or grain terminal industries most beneficially? 4B Braime are fortunate to be involved globally in the handling & processing of food - a huge natural growth industry – and the important part 4B Braime can play is to contribute to the ongoing improvement in the both safety and efficiency in the processing and distribution of food across the globe.